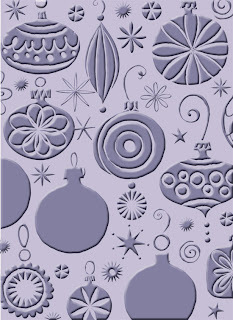 Oh what fun this Christmas Ornament Embossing folder is going to be. Take a look below to see my card. These embossing folders can be used with the Cuttlebug, Sizzix, Wizzard and most die cutting machines. This folder sells for $4.45 plus shipping. Please e-mail me if you would like to purchase it. I accept Visa, Master Card and PayPal.